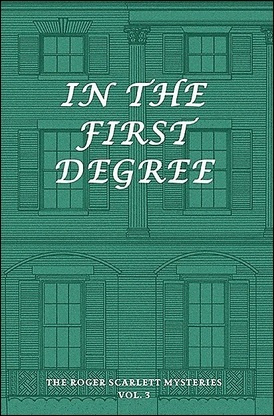 In the First Degree (1933) is the fifth and final detective novel by "Roger Scarlett," a shared pseudonym of Dorothy Blair and Evelyn Page, which distinguished itself by disregarding the formula of the previous novels and blotting out all of the secondary characters – like Sergeant Moran and Underwood. Inspector Norton Kane, of the Boston Police, is still present, but has to act in an unofficial capacity and has to conduct his investigation from the shadows. Sometimes quite literally. But the one thing that has remained the same, as in the previous novels, is that book is, what they call in Japan, a yakata-mono (a mansion story). This time the dark, gloomy mansion is Boston's historic Loring house, a rare survival of Federal period architecture on Cambridge Street in Bowdoin Square, where a murder is brewing. Inspector Kane ends up there, as a paying lodger, in a rather roundabout way. Kane is recovering from a "siege of influenza" and has been granted a four week leave of absence to regain his strength, but the opening chapter finds him a state of "infinite boredom" in a Boston hotel room and therefore welcomes the announcement of an unexpected visitor. The name of the visitor is James Faraday, a friend of Aaron Loring, whom he believes is in mortal danger. However, Kane dismisses his visitor as a neurotic man until he opens a package that had arrived before Farraday. A package that contained a book, Petronius' The Satyricon, which has been bookmarked at "The Tale of the Widow of Ephesus" and in a blank space, in the middle of the page, he read two words, "Help me," written in pencil – inside the front cover was a bookplate bearing the name Aaron Loring. So that piqued the interest of the bored policeman and Kane decides to take a look at the Loring house himself, which is when an unlikely occurrence brings him within the walls of the Loring mansion. As Kane slinks around the dark house, he sees how, all of a sudden, a sheet of cardboard was put in one of the top-floor windows with the word "Rooms" crudely printed on it. So the inspector has an excuse to make an inquiry, however, the woman he gets to speak to, Miss Julia Vincent, who's Loring's sister-in-law, knows nothing about them renting rooms and the cardboard is nowhere to be found – which does not prevent him from actually getting the room. Kane, as he surreptitiously listens to conversations in the shadowy nooks, discovers that the people who live there are not very happy. And very lonely. Kane overhears Sara Loring telling her sister, Julia, how they must breakthrough "this dreadful isolation." Ho-Ling Wong mentioned in his review of the book how the opening chapters have "a unique atmosphere" and are reminiscent "a Gothic thriller novel," which is a good description of how this story begins. You can almost read like a nostalgic homage to the Victorian-era thriller with dark secrets and shifty characters slinking around in the rooms and hallways of a gloomy, moldering mansion. And that all pervading fear that something dreadful is about to happen. This large, sprawling mansion proved to be a perfect backdrop for such a story as the place has an abundance of empty rooms, only occupied by the memories of the past, which has this sense of "beautiful neglect" about it. 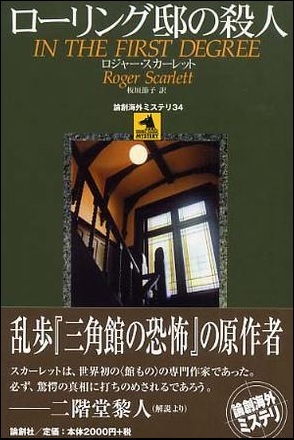 So the backdrop of the plot is, alongside the L-shaped mansion from Murder Among the Angells (1932), the best in this series of mansion-themed detective novels. Despite his presence, Kane was unable to prevent the death of Aaron Loring, who died in his bed, which his personal physician, Dr. Greenevb Hewling, determined to have been due to heart failure, but Kane smuggled another doctor into the home – who said Loring had died from an overdose of morphine. A dose that had been administrated with hypodermic syringe. So why did Dr. Hewling claim Loring had simply died of heart failure? Kane uncovers that Dr. Hewling was having a secret affair with Sara, but also has to figure out who defaced a portrait of Loring, and why, as well as dealing with his servant, Lander, who surprisingly turned out to be main beneficiary of the will. Loring gave his wife nothing more than he was legally obliged to give her! Honestly, at this point of the story, I began to lose a little bit of hope, because I could not see how the solution could be anything but anti-climatic. Luckily, I turned out to be wrong. Very, very wrong. As the ending was quite surprising! First of all, the ideas on which the solution stands are not new. I've come across countless variations on this trick over the years, but Scarlett crafted a daring variant on this trick that was fraught with risk and pitfalls for the murderer – eventually resulting in a second attempt at murder. A spur of the moment attempt that surprisingly failed. Usually, such characters don't pull through. And this attempted murder is closely connected to the clue of the mop that was hanging out of a third-story window to dry! Sure, you can argue that the murderer's scheme is completely bunkers and not at all plausible, but I believe Scarlett skillfully handled this tricky, twisted plot and the attempted murder demonstrated the plan had its weak spots. Besides, realism be damned! As to the clueing, the hints are primarily hidden in the situation within that home, the characters themselves and the actions they take. All of these clues could put the reader on the right track to the murderer. However, I should mention that Kane kept, what he saw in the darkened bedroom, to himself, which should have been shared with the reader. This is not exactly a stumbling block to the solution, but it would have been nice had we gotten the entire picture. And it would have worked perfectly as a red herring. 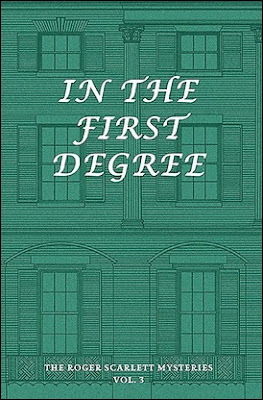 So, on a whole, In the First Degree is a well-written, excellently plotted detective novel with a classic solution that I would place, along with Cat's Paw (1931), slightly below Murder Among the Angells, but above The Beacon Hill Murders (1930). Only real downside of the book is that it was the last in an altogether too short-lived series, but I suppose the authors had said everything they wanted in this genre. Something that may explain why this last one was a departure from the earlier ones. Thankfully, I still have The Back Bay Murders (1930) on the pile and I'll be saving that one for next month. Culture Clash: "The Puzzle Duel" (1928) by Miles J. Breuer, M.D. Miles J. Breuer was an American physician and short story writer, who wrote science-fiction for Amazing Stories and Amazing Stories Quarterly, but Michael Gray, of Ontos, unearthed a scientific detective story by Breuer back in 2015 – which he accurately described as "a locked room mystery of sorts." Another locked room story that was overlooked by Robert Adey in Locked Room Mysteries (1991). However, the locked room murder is simplistic and breaks one of Father Knox's ten commandments, but what's interesting is the inverted nature of the plot that comes with a nifty, little twist in its forked tail. 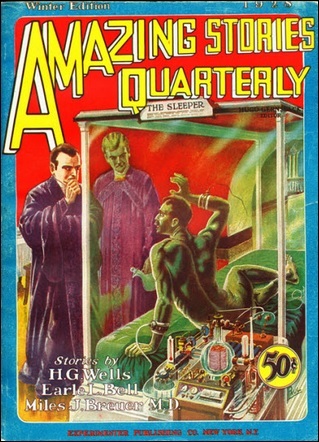 "The Puzzle Duel" was originally published in the 1928 winter issue of Amazing Stories Quarterly and is narrated by a young man, Peters, who's a student at the University of Chicago where he befriends his roommate, Raputra Avedian – a young Hindu who studies electrical theory in the physics department. They got along very well, but one day, Peter is a witness how the normally calm and composed Raputra slaps a German student across the face. Schleicher has a reputation of being personally difficult to get along with and, in response to the slap, challenges Raputra to a duel. Raputra is insulted enough to pick up the challenge. Peters and Jerry Stoner, another student, conclude that these "benighted foreigners" consider them "under obligation to arrange a fight between them." And this where the story becomes both interesting and unintentionally funny. You see, Peters and Stoner aren't so much worried about two students "hungering for the other's life," as they are about the police or their professors finding they're planning a duel, which resulted in an unorthodox compromise – "a modern, scientific duel." The fight is going to be "a battle of wits" to devise "a secret, silent blow." Because, you know, having them plot and scheme a perfect murder in secrecy is guaranteed to have a better outcome than as when they would have simply met in an open clearing with rapiers or pistols. In any case, the idea is a novel variation on the inverted mystery, in which you have two known parties plotting each others demise and the premise, like was the case with the previous short story I reviewed, deserved further exploration. A mere four pages was hardly enough to do the idea any form of justice. So, after setting the stage, the murder is committed and it's Raputra who bites the dust inside the college dorm-room he shares with Peters. The door that opens into the corridor was locked from the inside and the only window in the room had also been closed from the inside, but somehow, Raputra died on the floor of their bathroom without a mark on his body. However, this locked room trick is not a very interesting one and a blatant cheat to boot, but how the murderer received his much deserved punishment, after apparently having gotten away with murder, ended the story on a high-note – particularly liked the instrument of justice. You can probably see the twist coming, only a four-page story, but how it was done is what made it memorable. Something John Rhode could have come up with! So, on a whole, "The Puzzle Duel" is not a overlooked, long-lost classic of locked room genre, but, as a short story, it was a nice, quick and diverting read. You can read the story here (scroll to page 135). Don't worry, I'll get back to a full-length mystery novel for my next review. So don't touch that dial! A week or two ago, Mike Gray of Ontos posted a notice on his blog, titled "Certainly It Was Impossible," which highlighted an obscure short science-fiction story that was published in a 1953 issue of Amazing Stories and the plot description promised a traditional detective yarn set in the 22nd century – complete with a locked room murder and an old-fashioned detective. I have to say, I was not disappointed by what I read. Kendell Foster Crossen was a reviewer and writer of popular fiction, under a battery of pennames, who has strong ties to the locked room sub-genre. John Norris, of Pretty Sinister Books, reviewed The Invisible Man Murders (1945) and The Case of the Phantom Fingerprints (1945), but Robert Adey listed two additional titles in Locked Room Murders (1991). 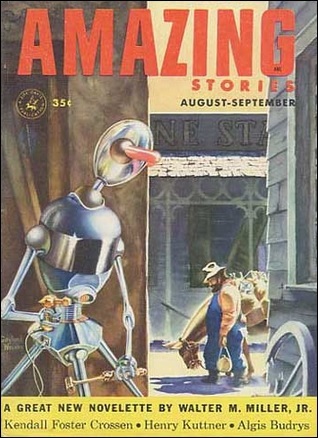 However, Adey apparently overlooked a short story, "The Closed Door," that appeared in Amazing Stories. A genuine impossible crime story with a dying message and an original solution, grounded in science-fiction territory, but with an old-fashioned twist that harked back to our own time – even one of John Dickson Carr's famous detective characters gets a mention ("If Gideon Fell could have lived to see this..."). My only quibble is that this story would have worked better, as a detective story, had it been a novella or even a novel-length story, because it would have given Crossen the opportunity to fully explain the science behind this universe. A better understanding of the science, behind the science-fiction, would have given the reader an honest shot at working out the locked room trick for themselves, which is a combination of old-fashioned trickery and futuristic treatment of plastic. Like a 22nd century version of an Arthur Porges locked room story. But this really should have been a longer story to do full justice to the plot. And it would bolstered the fair play element. Anyway, the story is still pretty good for what it is. The setting of "The Closed Door" is set at the Planetary Rest Hotel, which is the only hotel in the universe capable of "catering to every life form in the galaxy," because the entire building is constructed out of "two hundred and seventy-three different plastics." So even the extremely radiating Mercurians can stay there and one of the passing the locked room, around the time of the murder, turns out to play a key in the solution! One of those clever little cheeky things that you can get away in science-fiction detective. At the time of the story, the Planetary Rest Hotel is hosting The Galactic Acrylic Convention and the over-worked manager, Alister Chu, receives a disturbing call on his visiphone from the hotel's most important guest, Mr. G.G. Gru – a silicon-based Terran from Sirius II. Gru tells Chu that he can't abide practical jokers and orders him to come to his room immediately, but than all of a sudden, Chu sees Gru shaking on the screen, as if he's falling apart, and falling over. The last thing Chu saw on the video screen was a gloved hand turning off the transmission. As per Gru's instructions, the door of his room was replaced with a special Plexilite door that has been fitted with "a palm-lock keyed to the atomic structure of the guest." Only he could lock, or unlock, that door without damaging it. Inspector Jair Calder, of Planepol, has to blast open the door with a hydrocarbon gun and inside they find Gru slumped across his desk in front of the visiphone screen. A torn piece of paper is found with "a crude drawing of a six-sided figure and the letters COO," but most of this dying message has been made off with by the murderer. Only question is how the murderer managed to get past a door only a dead man could have locked behind him? The solution to the impossible murder has a foot firmly planted in two genres. On the technical side, the explanation is pure science-fiction and I know this is not very popular with everyone out there, but Crossen succeeded in pouring this science-fiction plot in the mold of the traditional detective. I also appreciate how the trick was not used as a simple, throw-away answer as to how to get pass a locked door, because the murderer still had to do some considerable work. And rely on some misdirection. But even more than that, I loved how this futuristic locked room trick hinged on a then historic item that is a normal, everyday object in our own time. You know when you read it. On the downturn, the dying message is unsolvable and the identity of the murderer, alongside the motive, is not as inspired as the impossible crime, but I blame the short length of the story for that. As a short (locked room) story, it was already better than Manly Wade Wellman's Devil's Planet (1942), which also deals with a locked room murder in space, and expanding the story might have resulted in something comparable to Isaac Asimov's The Caves of Steel (1954) – i.e. a minor gem. So, "The Closed Door" is a good example of how a detective story can be resettled in a science-fiction universe and an excellent demonstration how even speculative technology opens up, instead of closing down, new avenues for mystery writers who know how their way around a plot. You can read and judge the story for yourself here or, in two parts, here and here. 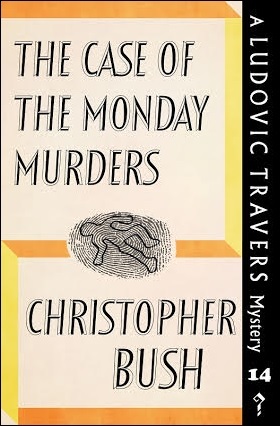 The Case of the Monday Murders (1936) is the fourteenth title in Christopher Bush's long-lived Ludovic Travers series and, in this instance, the story-telling turned out to be more interesting than the plot itself, which was as translucent as a ghost and lacked the complexity associated with Bush's earlier detective novels – c.f. Cut Throat (1932) and The Case of the Chinese Gong (1935). A somewhat unusual detective novel presented as a serial killer story, however, this is not entirely the case. Our neighborhood genre-historian, Curt Evans, who wrote the introductions for these brand new editions, published by Dean Street Press, pointed out that Bush's breakthrough novel, The Perfect Murder Case (1929), is not (as often argued) a serial killer novel. And goes on to state that The Case of the Monday Murders "unquestionable qualifies" as such. Only problem is that the titular murders only serve to dress up the actual plot and, if this one qualifies as a serial killer novel, than every Golden Age mystery with a body-count of two or three victims does. And, more importantly, the Monday murders aren't even the work of a serial killer. So I didn't tag this post with the "Serial Killer" toe-tag. However, the story-telling has some interesting aspects and Evans called the book "crime fiction at its most puckishly meta," because part of the story's background may have been inspired by Bush's first experiences with the Detection Club and there's a character who could've been modeled on the well-known, grumpy bugbear of the club, Anthony Berkeley – who was "a cross to bear" for his colleagues. The name of this takeoff is Ferdinand Pole, a celebrated mystery writer, who's the founding father of the Murder League. Pole has made a discovery that a "perfectly uncanny number of unsolved murders" that "have taken place on Mondays" since 1918 and claims one and the same person is behind all these murders. A serial killer or perhaps even a new Jack the Ripper. Pole communicates his finding to a newspaper, Evening Blazon, which brings us to the secondary theme of the story that critically glances at the sensationalists, scandal-mongering print-press of the time. Evening Blazon splashes their pages with thickly printed headlines like "MURDERS ON MONDAY," "WILL THERE BE MURDER ON MONDAY?" and "WE CHALLENGE SCOTLAND YARD." Later in the story, a person, who calls himself "Justice," claims to be the murderer and provides details of his crimes. He even describes himself as an elderly man with a squint. Bush also gives the reader a glimpse of the typical English response to this latest sensation. The figure of the man with the squint became a public joke and the BBC's pet comedian, Giggling Gilbert, made people roar with his song "I don't want to be murdered on Monday." However, as said above, the serial killings only serve as a background, or framing, for the investigation into two other murders. T.P. Luffham was a once well-known schoolmaster of a prestigious public school, but had to resign with "ugly rumors" abound that were never officially denied. The nature of those rumors aren't made clear, but there's a possibility Luffham pulled a Sandusky on the students. After he had withdrawn from public life, Luffham assumed the name of Clough and began to life as a hermit. And the story went around that he had died somewhere abroad. So the news of his accidental death came as a surprise to Travers, who also assumed he had passed away, which prompts him to accompany a junior crime-reporter of the Evening Blazon, Tristram Cane, to the scene – where they discover that the old man had fallen down a flight of stairs. However, Travers and Cane find a black elastic-band and a drawing-pin, which could been used to stretch the elastic across the top of the stairs. This is a murder on a Monday and not long thereafter the newspaper headlines scream: "GREATEST PROPHECY OF THE CENTURY!" and "T.P. LUFFHAM WAS MURDERED!!" The second murder is that of an elderly actress, Laura Delayne, who was stabbed to death in her hotel room, where she lived, but here the story began to loose steam. After a while, it becomes clear that the serial killing are only there to muddle the waters and the investigation is primarily focused on digging into Delayne's past or finding a connection with the first murder. This would not have been problem had there been more than two suspects, but the murderer sticks out from the very beginning and becomes impossible to ignore as the story progresses – especially when the only other suspect becomes the victim of an attempted murder. An attempt that could not been faked by this person in order to throw suspicion off him. 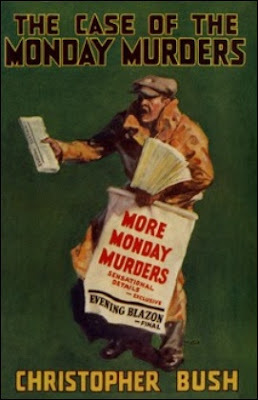 So, on a whole, The Case of the Monday Murder turned out to be a rather disappointing read. Sure, the story-telling was good, particularly during the first half, but the plot is so thread-bare that you can see through it from the beginning. Honestly, it's kind of hard to believe that this came from the same man who intricately plotted Dancing Death (1931), The Case of the April Fools (1933) and The Case of the Missing Minutes (1936). Yeah, this is, unfortunately, the first time Bush let me down, but only a single dud out of nine titles read is not a bad score at all. So let's end this review on that semi-positive note. Major Cecil John Charles Street was simply John Street to his personal acquaintances and is remembered by mystery readers as either "John Rhode" or "Miles Burton," two of his pennames that were signed to over a hundred detective novels, but Street was tarred and feathered as a humdrum writer by the detractors of the cerebral detective story – which likely played a part in obscuring Street's work after his passing in 1964. At least until recently, that is. This decade has blossomed into a renaissance era for the traditional detective story and an ever-expanding band of long-neglected mystery writers are finding their way back into print. John Bude, Christopher Bush, E.R. Punshon, Harriet Rutland and Roger Scarlett are just a handful of examples of mystery writers who have recently been rescued from biblioblivion, but, now that humdrum is no longer a derogatory term, J.J. Connington and Freeman Wills Crofts also reappeared in print. Crofts is even shedding his undeserved, completely slanderous, reputation as the writer who cured insomnia. Street is considered by many as the headmaster of the humdrum school, but is lagging behind Connington and Crofts when it comes to getting his work reprinted. British Library reissued The Secret of High Eldersham (1930) and Death in the Tunnel (1936) and Ramble House printed new editions of Death Leaves No Card (1940) and A Smell of Smoke (1959) – all four of them published as by "Miles Burton." A pseudonym Street used for his secondary series-characters, Desmond Merrion and Inspector Arnold. However, Street is best remembered, if remembered at all, for the detective novels he wrote as "John Rhode" and they, too, are finally starting to reappear in print! HarperCollins is currently reprinting an entire series of obscure, long-overlooked mystery novels as Detective Club Crime Classics and Rhode's primary series-characters, Dr. Lancelot Priestley, is part of the lineup! Brand new editions of Death at Breakfast (1936) and Invisible Weapons (1938) have already hit the shelves, which will be followed later this year by The Paddington Mystery (1925) and Mystery at Olympia (1935). So the mystery readers who love meticulous plotted detective stories have something to look forward to! Invisible Weapons was released only a week, or two, ago and immediately snatched a copy for my personal locked room library. Yes, this is one of Rhode's altogether too rare excursions into the impossible crime genre and the apparently inexplicable murder from the first, of two, parts of the story would have been right at home on the pages of a Carter Dickson novel. 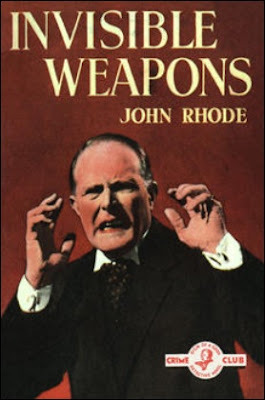 You can even make a case that the first murder here is, kind of, a relative of the two impossible slayings in The Unicorn Murders (1935), which looked like the work of the legendary (invisible) unicorn – except that Rhode offered a different explanation. And the overall story was, as to be expected, more down to earth. The story begins with Constable Linton of the Abberminster Police going around to the home of Dr. Thornborough, aptly named Epidaurus, to discuss a local nuisance, Alfie Prince, but the doctor is not home and the constable is asked to wait for him in the consulting-room. And there he hears how another unexpected visitor arrives at the home. Robert Fransham is Mrs. Thornborough's uncle and claims to have received an invitation to come down, from London, to discuss a private matter, but the Dr. Thornborough never wrote such a letter and now Fransham failed to emerge from the cloakroom – where he was washing his hands. So the constable has to batter down the locked door and inside they find the body of Fransham stretched on the floor with an inexplicable wound in his forehead. The cloakroom had been locked on the inside and the only window had a small, open panel of frosted glass, which looked out on upon the carriage-way and the outside of this window was protected by stout iron bars. Framsham's chauffeur, Coates, was in full view of the carriage-way and swears nobody had entered the carriage-way at the time of the murder. Superintendent Yateley favors Dr. Thornborough as the murderer, but he has no way of proving it. The cloakroom had been locked on the inside and no murder weapon had been found there, which makes the use of a projectile unlikely. So he calls upon Scotland Yard to figure out how the murder was committed and Superintendent Hanslet assigns young Inspector Jimmy Waghorn to the case. Waghorn represents here, somewhat, of a weak link in the overall plot. Steve, the Puzzle Doctor, of In Search of the Classic Mystery Novel, was one of the first to review this new edition and observed that Waghorn's fluctuating intelligence is on full display here. I agree. Waghorn showed competence when questioning people, gathering information and even making an important discovery in the wall that faced the window of the cloakroom, but was unable to put two and two together to work out the murder method – a nifty, innovative new take on an old trick. A seasoned armchair detective will have no problem imagining how the locked room trick was worked when learning the shape of the wound in combination with the situation within that cloakroom. So why Waghorn didn't catch on is a little baffling. Still, I had fun in the first part putting together, what turned out to be, a false solution largely based on Fransham personality, his (family) back-story and a worn greatcoat from the First World War. I began to warm to my own theory as it began to take shape, but, at the end of the first part, Waghorn admitted defeat and threw the towel in the ring. The second part of the story concerns the death of Sir Godfrey Branstock, who was found dead in his own wine cellar during his birthday party, but the peculiar link here is that Sir Godfrey was the next door neighbor and landlord of Fransham! And we all know that can't be a coincidence. At this point in the story, Dr. Lancelot Priestley, who made a brief appearance in the first half of the book, becomes more active and helps Waghorn and Hanslet with figuring out how both murders were pulled off. Priestley gives an after-dinner demonstration how the murder weapon in Fransham case could have a vanished from a locked room using a calf's head and his explanation for the murder of Sir Godfrey shows why Rhode was the genre's engineer of crime. 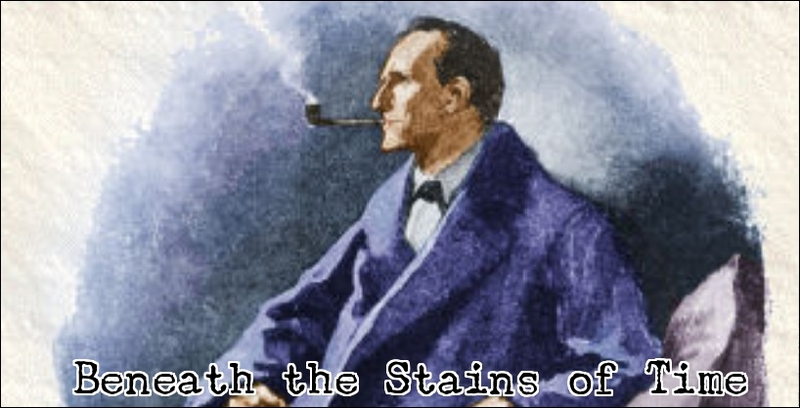 You can place question marks behind the feasibility of the murder methods, but the ingenuity of the plots is one of the hallmarks of Rhode's detective-fiction and is what makes them so fun to read. Bush and Crofts were craftsmen who constructed and destroyed cast-iron alibis. John Dickson Carr found out ways to accomplish the seemingly impossible and Rhode was a technically-minded writer who used the marvels of modern science and mechanics to shed people of their mortal coil. 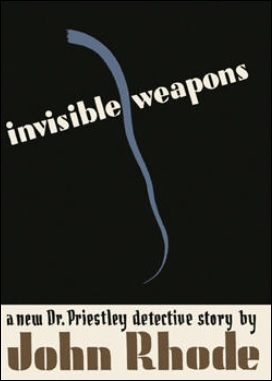 Invisible Weapons is a good example of his technical prowess and ingenuity. Highly recommended to everyone who loves pure, plot-oriented detective stories. I hope HarperCollins, or any publisher out there, continues to reissue his work, because there many titles within his immense body of work that need to be reprinted as soon as possible. Personally, I would like to see Death at Low-Tide (1938), Murder, M.D. (1943), The Three-Corpse Trick (1944) and The Cat Jumps (1946) getting reprinted, which are part of the Desmond Merrion series. As for the Dr. Priestley novels, I would very much like to see Dead Men at the Folly (1932), The Corpse in the Car (1935), The Bloody Tower (1938), Vegetable Duck (1944) and Twice Dead (1960) appear back into print. So, if any publisher is reading this, you would do all of us a great service if you can get those reputed gems on our bookshelves. I believe Steve, the Puzzle Doctor, wants to talk with you about getting Brian Flynn reprinted. So far my rambling review and I'll be returning to Bush for the next one. A.B. Cunningham was an American teacher and professor, who taught English for twenty years at Texas Tech University in Lubbock, Texas, before retiring in 1945 as a professor emeritus, but, as was not entirely uncommon in those day, he had a secondary career as a mystery novelist – which became a full-time occupation after he retired from teaching. Cunningham wrote roughly twenty detective novels about his series-detective, Sheriff Jess Roden, who serves the people of rural Deer Lick, Kentucky. A county with as high a murder rate as Cabot Cove up there in Maine. Cunningham was brought to my attention by The Anthony Boucher Chronicles: Reviews and Commentary, 1942-47 (2009), which praises his rural detective stories for its "memorable writing” and "fine regional flavor." Boucher was reputedly quite a fan and called him "an unclassifiable master." So all that praise caught my eye and, back in 2011, I got my hands on an inexpensive paperback of Death Haunts the Dark Lane (1948) and the slice of rural Americana was definitely the most memorable aspect of the story, but, according to my own review, the plot wasn't all that shabby either – warranting a second look at the series. And, after nearly seven years, a return trip to Deer Lick has been long overdue. The Strange Death of Manny Square (1941) is the third book in the series and the opening chapters immediately gives the reader a taste of Cunningham's famed regional flavor. Cunningham begins by looking back at some of the exciting events that had stirred the people of Deer Lick in the past. Such as a "Great Disappointment" when an end-of-the-world prophecy didn't pan out or when Gus Luker had claimed that his grandmother had foretold the assassination of President William McKinley, who had read it in "the webs of spiders," but none of them had generated as much excitement or speculation as the murder of Manny Square. A pillar and leader of the Deer Lick community. Manny had inherited his farm from his father, Emanuel, who had divided his land and houses between his two sons and their mother. Wayne had been Emanuel's favorite son and he was allowed to pick between two plots of land, but, during "a two-year circus," he had run through in his inheritance and even the bank could no longer finance his lavish house parties – all the while his older brother had doubled the value of his inheritance by turning it into a rolling, fertile farmland. Their mothers, Old Lou, was a woman of the old stock and was described as being of "the caliber that would keep on loading and firing her rifle over the dead body of her son" until "the last redskin lay twitching from her own rifle ball." However, the strong-willed Old Lou had to admit defeat when Manny married a comely, working-class girl, Lizzie Bogle, who Old Lou tried to reinvent as Mrs. Beth Square. She was unsuccessful. So this sets the stage for when the news reaches Sheriff Roden that Manny had met with a fatal accident in his own stables. Apparently, Manny had been killed by "a smashing kick" to the face by his great white mule, Ligre, who some suspect had simply been biding his time to strike out. Regardless of appearances, Sheriff Roden is terribly suspicious of the situation and, quick and neatly, deduces that Manny had been murdered, which he based on the location and nature of the head wound that showed that not the toe, but the heel, had struck first – demonstrating that the fatal blow had come from above instead of below. And almost as quickly, he works out that the murderer must have wired a mule-shoe to a sledgehammer and dropped it on Manny's head from the overhead mow. However, the how is only the first step in figuring out who-and why, for which there are more than enough candidates. Wayne is in dire need for money and Lizzie turns out to have a secret affair with one of her husband's hired hands, Fred Sutton, giving them all a rock-solid motive for murder. Then there was a petty, long-standing feud between Manny and his next-door neighbor, Brady Heard, who had refused to place a fence at the summit of his stone quarry and Manny had been too headstrong to do it himself – claiming that it was Heard's responsibility to take the precaution. Every now and then, an animal would fall into the quarry and the same would happen, a day or so later, to one of Heard's animals. So there you have nearly all of the components of a knotty, complicated detective story, but, in spite of appearances, the observant reader should be able to arrive at the same conclusion as Sheriff Roden without too much difficulty. All of the evidence needed to answer who killed Manny Square, and why, is hidden within the personalities and behavior of the suspects. 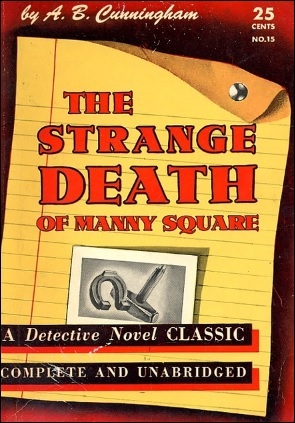 The Strange Death of Manny Square definitely qualifies as an old-fashioned, fair play detective novel, however, the main attraction of the book is not its plot, but the writing and backdrop of the story – which reminded me of the writing of Arthur W. Upfield. Roden is even described as "a tracker," who can read and extract information from animal tracks and human footprints, giving him the same qualities as Upfield's half-aboriginal policeman, Detective-Inspector Napoleon “Bony” Bonaparte. Arguably the greatest tracker in all of detective fiction. Unfortunately, no matter how good the writing or plot may be, this specific title is never getting reprinted in this day and age. There are three black characters in the story and how they're being portrayed, or talked about, ensures that no publisher today would dare touching it. 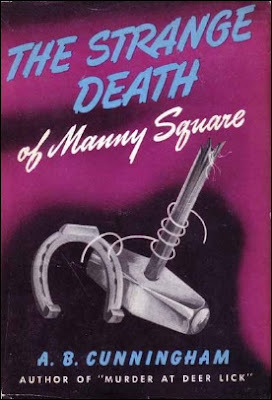 On a whole, The Strange Death of Manny Square is a well-written, decently plotted detective novel, in which the characters (largely) drive the plot, but the portrayal and treatment of the black characters will most likely turn off some readers today. However, if you can read this story within the time-frame it was written, you'll probably be able to admire the positive aspects of this rural detective novel. On a final note, I was planning to return to Christopher Bush, but a particular locked room mystery arrived in the mail today. So that one is going to be next on the list. 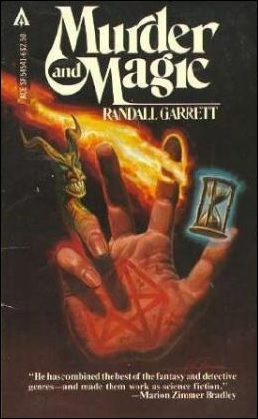 Last week, a positive review of Randall Garrett's Too Many Magicians (1967) appeared on Mysteries Ahoy, which was voted by a 1981 panel, spearheaded by Edward D. Hoch, as one of the fourteen all-time greatest impossible crime novels, but personally, I thoroughly detest the infernal book – giving it spot on my 2014 list of "Least Favorite Locked Room Mysteries." So, naturally, I was balking in the comment-section how awful the book really was when "JJ," of The Invisible Event, dropped by with an astonishing claim. According to JJ, the short stories in the Lord Darcy series are "variable" in quality, but the one where "a man is found hanged in his office," despite no-one having gone in, contains "a trick so devious" he'd probably put it in his top 20 locked room short stories. I happened to have a complete omnibus edition of Garrett's Lord Darcy collecting dust on my shelves, which made it even more tempting to give this series a second shot by taking a look at "A Stretch of the Imagination." So damn you, JJ, for making me return to this series and I'll damn you again at the end of this review, if the story turns out to be really good. First of all, an introduction of the series in order for the people who are not familiar with Garrett's Lord Darcy, because the books merged the fantasy genre with the traditional detective story. 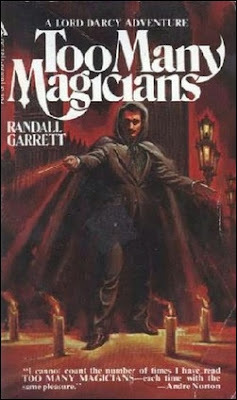 And as much as I dislike the sole novel in this series, Too Many Magicians, I do admire Garrett's attempt to transplant the fair play concept of the classical detective story to a world rife with wizards, spells and the black arts – which makes for an interesting alternative universe. In this alternative universe "Richard the Lion-Hearted did not die in the year 1199," but went on "to found the mightiest and most stable empire in history" where "the laws of Extra-Sensory Perception (ESP) have been codified." However, the laws of physics remain unsuspected. So in this world "magic is a science." The greatest detective of this Anglo-Franco Empire is Lord Darcy, Chief Criminal Investigator for His Royal Highness, Richard, Duke of Normandy and Officer of the King's Justice, John IV, King and Emperor of England, France, Scotland, Ireland, New England and New France, King of the Romans and Emperor of the Holy Roman Empire. Imagine the printing costs of his personal calling cards! Lord Darcy is assisted by Master Sean O Lochlainn, Chief Forensic Sorcerer, who always struck me as a convenient plot-device to eliminate the use of magic from the list of possible solutions or use his magic wand to uncover clues. The story JJ spoke so highly of is "A Stretch of the Imagination," originally published in Of Men and Malice in 1973 and collected in Garrett's Murder and Magic (1979), which takes place within the walls of one of the most important publishing houses in Normandy, Mayard House, where staff members heard a thump and noises through the thick doors of the private-office of Lord Arlen – who owns the publishing house. However, nobody dares to enter the office until the Chief Editor, Sir Stefan, takes the charge and enters the private sanctum of his boss. Lord Arlen was hanging by his neck from a rope that been thrown over a massive wooden beam and below his feet was an overturned chair. Nobody had entered, or left, the office in over an hour. So clearly a case of suicide, but, whenever a member of the aristocracy dies violently, an Officer of the King's Justice has to make a formal inquiry. Enter Lord Darcy and Master O Lochlainn. Master O Lochlainn is waving "a small golden wand" around the crime-scene and senses that "there was no one else in the room at the time he died." He was also able to eliminate the possibility of an evil influence or the use of black magic in the room. Later on in the story, O Lochlainn casts a spell on the rope used to hang Lord Arlen and it sprung to life to retie itself in the slip-knot noose that the murderer had originally tied. I know wizardry is an established science in this universe and Garrett never uses magic as a solution, but I did not care for these magical intrusions in my detective story. I guess fantasy just isn't my genre, which is weird, since my all-time favorite novel is Michael Ende's The Never-Ending Story (1979). Luckily, this time, the plot was far more inspired than the boring, slow-moving Too Many Magicians, which borrowed its locked room idea from John Dickson Carr, but here the reader is treated to a novel explanation as to how the murderer managed to hang a man, all alone, inside a closely watched office – based on a crushed larynx, height of the chair and a slightly open window. A type of trick you'll often find in Gosho Aoyama's Case Closed series (e.g. the hanging story from Vol. 57). Considering my disdain for this series, I was pleasantly surprised that the story, as a whole, turned out to be pretty solid with an original solution for its impossible crime. I'm not sure it would make my top 20 list, but the story was good one. Although the locked room-trick would probably have been better served in a detective story without all the magic trappings. However, that is a bit of nitpicking on my part. So that leaves me with one last thing to say: double damn you, JJ, for not being entirely wrong about "A Stretch of the Imagination." You may continue to practice as locked room expert. For now, anyway.